The icicles and snow are melting, and the rain helps tremendously with this process. They said we might get flooded because of the snow piles, but so far so good. We are still blessed. 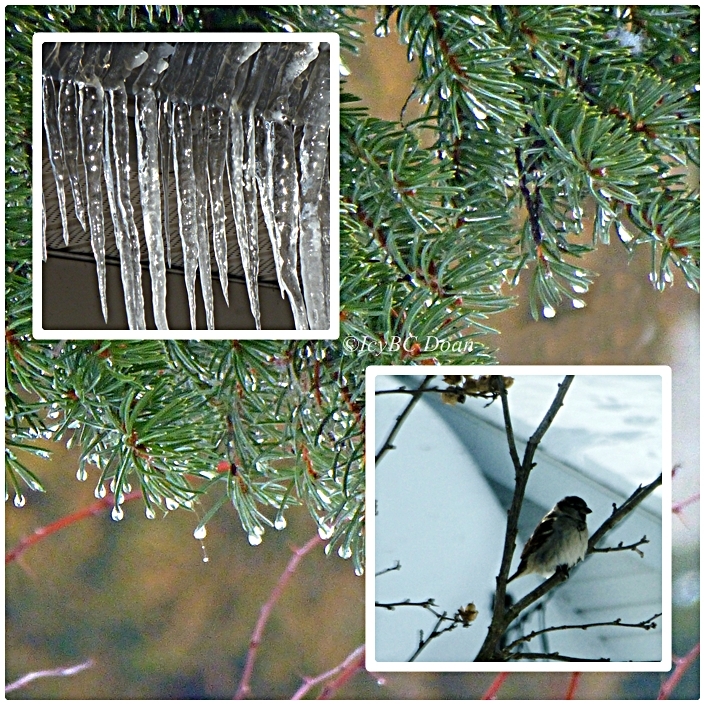 Electricity is on; heat is on; no frozen pipes! We are warm and safe! We got over the first storm of the New Year, and life is still good. Hope that everyday is so far so good. We are having much the same weather here. I like the evergreen photo! The icicles are very beautiful and you captured them so well. Looks very pretty! Lovely shots. Love the evergreen photo, too!! Hope you have a great week! Stay warm and dry!! You folks who have to live through this are made from heartier stock than people who live around here. A rain storm results in chaos on the roads. I can't imagine what ice and snow would do. These views and glitters on leaves are very lovely for me, as in our case some dewdrops on leaves easily evaporates in this part of the world. Lovely pics - like the mosiac especially! Good news that all is well - we've got the opposite problem here, we're too hot, it's miserable!